Publisher: Rahr Malting Co., 1934. Soft Cover, 158 pages, 9. x 11.50. Shortly after the end of prohibition in 1933, the Rahr Malting Company of Manitowoc, Wisconsin published this wonderful book -- an ode to everything malt. 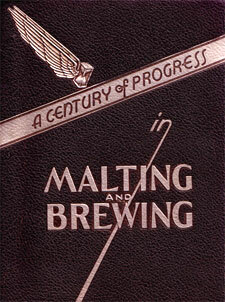 It gives elaborate detail on the state of malting science and processes in the 1930s, particularly at Rahr, one of the brewing industry's primary suppliers throughout the pre-prohibition era (and destined to continue in that role for many decades after this book was published). Eighteen chapters, profusely illustrated, delve into just about every imaginable aspect of barley malting: grain cleaning, sampling and testing, weighing methods, point system for grading malt, imported malts, malt types, aromatic qualities, roasting, color and flavor, malt-to-barrel ratio, wheat malt, and on and on. Talk about rare! Only about a half-dozen copies of this book exist in American libraries! The book has a highly unique steel-screw-binding construction, with a black leather cover (real leather?) and striking embossed silver lettering, very much in the art deco style of the 1930s.